Steam sweet potato until soft, approximately 15 minutes. Check the softness, it should be easy to mash with spoon or fork. Let cool, mash the sweet potato. Combine brown sugar and glutinous rice flour with mashed sweet potato, knead into smooth dough. If the dough is wet and too sticky, add a bit more glutinous rice flour. Divide dough into small portions, roll into small bite size balls. Heat cooking oil and deep fry sweet potato balls until golden. It takes only a few minutes. The balls should float when it's done. 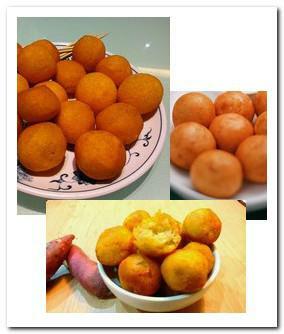 Deep fried sweet potato balls are delicious and easy to make. It is about one inch, beautiful golden color, and in smooth round shape after deep fried. It is sweet, soft and a little chewy in the mouth, it is really good when serve warm during cold weather.